Thanks again for all the kind words about our free online classes. And we’re just getting started. Here are 5 new classes scheduled for March. Each class will be limited to the first 1000 people to sign up, but if you miss out or can’t make it, don’t worry because we will record the class for you to download and watch later. RootsMagic has over 100 built-in charts and reports to help you visualize and share your family history. But sometimes you may be looking for a very specific report or list customized to your taste and needs. That’s where RootsMagic’s Custom Reports feature comes is. Join us for a demonstration of how to use this feature to make new reports that are all your own. Family Atlas is the fun and easy way to map your family history. Trace your ancestors migration around the world and pinpoint the sites of important family events. Import your family data directly from your genealogy software, then create and print personalized family maps. Join us for a demonstration of this impressive software. RootsMagic makes it easy to add and edit people, relationships, facts, and events to your file. Join us for an in-depth look at how to build and shape your family tree using RootsMagic. There’s so much more than just pedigree charts! RootsMagic offers a wide-variety of lists and reports to help you visualize and share your family history. Join us for a look at each of them how they can show you surprising details about your family tree. So you’ve wanted to write a personal history but get overwhelmed with the size and complexity of the task. Where do I start? What do I write? How do I make it interesting for others to read? Join us for an entertaining look at methods to recall, organize, write, and publish personal histories about yourself and other individuals. Thank you, Thank you — learning so much from your seminars.Type your comment here. These Webinars have been great! I’ve learned something new with each one. Looking forward to watching more. Thank you for the recorded seminars. I plan on watching all of them and hope to participate in some of them. Also, thanks to Bruce & Mike for their presentation at the Sun City West Computer club last month. I hope Bruce’s voice held up for the remainder of their stay in Phoenix. Careful on the time folks, US starts summer (DST) on 13-March so seminars starting after that date may differ in your timezone as Thetimezoneconverter.com is showing you the conversion for NOW, not then. Recompute after 13-March to get correct times. In January 2011, I moved to RootsMagic 4 from another software program. I am taking full advantage of all the great webinars you offer. I am impressed with RootsMagic and glad I made the move. I am also using RootsMagic To-Go on a mini drive and so far it is working out well for me. The webinars really add a lot of value for those of us that want to get the most out of the software we are using. Thank you. Thanks for the webinars! I have learned so much from them you guys rock!! I have been using RootsMagic since it first came out, but I have learned some very helpful points from your classes. I plan to take several more, especially on the map program. Thank you so much for the webinars. I put them on a min drive and have went over them many times and everytime I find something I missed. Who says you can’t teach old dogs new tricks. Learning nore each viewing. We started our computer genealogy when Family Origins first came out and have used and promoted the use of your programs ever since but your webinars and the fact that you have them on the website far out does all the other programs on the market. Our congratulations to Roots Magic Bruce and the whole team for the outstanding program and customer support. I really appreciate your online availability of webinars and lessons. I work full time and don’t often get a chance to participate in such offerings when they are scheduled live, but I am so grateful to be able to have the information offered when I am available and can go back again and again to absorb what is taught. Thank you so much! I also have owned RootsMagic from the beging. Started with Personal Ancestral File 2.2 and before wentt to Family Origins And then RootsMagic. This is the best keep up the good work and don’t let up on the bugs although I have not found many. 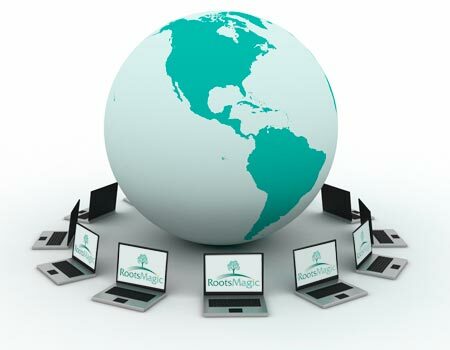 I have been working with Rootsmagic ever sense RootsMagic 4 came out and I have learned somthing new at each webinar.